Scars are a natural result of the skin’s healing process after traumatic injury, surgical procedures, acne or other inflammatory skin conditions. This process is influenced by a number of factors including the size and depth of the wound, the location of the wound and the presence of infection during healing. Age, gender and ethnicity will also help determine the final appearance of a scar. Many patients seek treatment for scars that may be cosmetically bothersome and there is a wide range of treatment options available depending on the type of scar one has. Hypertrophic and Keloid scars are thickened and raised. They may also be associated with pain, itching, or other sensations. Some individuals are prone to forming keloid scars more easily. Keloids are more common in those with darker skin and in locations such as the chest, shoulders and earlobes. Treatment includes cortisone injections, laser therapy and surgical removal. If you know that you form keloids easily there are treatments that may prevent them from forming after surgical procedures. 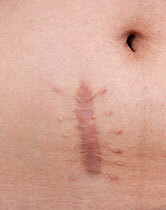 Discolored scars are especially prevalent after the initial healing process is complete. Red and brown color can accentuate the appearance of an otherwise small and flat scar. 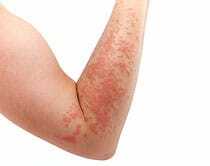 Laser therapy, exfoliating agents, bleaching agents, and cosmetic peels can very effectively blend these scars into the surrounding skin. Acne scars are a consequence of moderate to severe forms of acne. They are a source of embarrassment for many, even years after acne may have disappeared. Any of the above mentioned treatments might be appropriate for acne scars in addition to resurfacing lasers and microneedling. Treatment of underlying acne is vital to preventing further scars. The best scar treatment is prevention of scar formation. 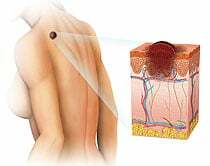 If you have a skin biopsy, surgical treatment or invasive cosmetic procedure performed at the Center for Dermatology & Laser Surgery, we will equip you with the necessary tools to minimize any scar that may result.